De Nederlandse media wilden geen aandacht besteden aan een Duits onderzoeksrapport uit 2011, dat naast andere soorten vooroordelen en discriminatie in Europa ook antisemitische opvattingen peilde. Tegenover Polen en Hongarije staken Nederland en andere Westeuropese landen nog gunstig af, en met 5 tot 20% bevooroordeeldheid had Nederland ook binnen West-Europa de minst slechte score. * Door Israels uitroeiingsoorlog nam het aantal Palestijnen dramatisch af van 1,3 miljoen in 1947 tot 10 miljoen tegenwoordig (volgens Wikipedia). I wrote an article about these widely held beliefs, which resemble the dark anti-Semitic views propagated during the Middle Ages. I sent it to two Dutch newspapers. Both refused to print it. It was then published on one of the Netherlands' largest blogs, Dagelijkse Standaard. This blog is also read by journalists from the major Dutch papers, yet they did not publish anything on the study. Only a small Christian internet radio station, Pillar of Fire, whose editor was shocked by the report's findings, contacted me for an interview. Many major Dutch media publish trivial items about Israel, as long as they are sufficiently negative. Both the abject belief of about 5 million Dutchmen and the media's silence on the extreme hatred of Israel reflect aspects of what is radically wrong with Dutch society. However, I received some private reactions. Several were from whitewashers who said the findings were wrong. They ignored not only this German study, but also a 2003 Eurobarometer study which found that 59 percent of Europeans thought that Israel was the largest threat to world peace. The percentage in the Netherlands was the highest among EU countries at 74 percent. In hindsight, reality is very different from perception. The Dutch and not the Israelis fought alongside the Americans in Afghanistan, while other European nations joined them in the Iraqi war. This had major consequences for the world order. Furthermore, the number of dead in both wars was far higher than those of all military campaigns Israel was involved in. A few other Dutchmen who wrote me about the article were shocked. One Dutch journalist informed me that my conclusions were right, yet he thought that they would not be acknowledged by the Dutch people. A third group included those who were well aware of the major problems concerning norms, values and attitudes in the Netherlands. Some of them believe that the country's degeneration is such that there is no hope for its future. One academic wrote: "Alas, this article was necessary." The Dutch media's silence didn't help the Netherlands' image much. The story of the diabolical view 5 million Dutch hold of Israel was picked up around the internet. An international Jewish TV station devoted a news item to it which was picked up by Ynet News. Canada's largest Jewish paper mentioned it on its website. Rabbi Abraham Cooper, Associate Dean of the Simon Wiesenthal Center raised this issue with Dutch Deputy Prime Minister Lodewijk Asscher during a meeting in the minister's office. He asked Asscher to combat the extremist views of many Dutchmen about Jews and Israel. The news about that meeting also spread on the internet. In Jerusalem, I was visited by a journalist from a Dutch TV station. He deliberated whether to do an interview with me on the German study, yet gave this idea up very quickly. I told that Dutch journalists often do not publish important information. He answered, "You are insulting me and my colleagues!" Yet, the lack of reaction to my article is only a small example of the sometimes long-lasting silence or distortion by the Dutch media and institutions of major negative Dutch issues. In 1969, the Dutch commander of an army unit, Raymond Westerling was interviewed by a Dutch TV journalist. His unit had put down an uprising on the now Indonesian island of Celebes in the late 1940's. Westerling admitted to major war crimes carried out by his soldiers, including executions of people without trial. He claimed that nothing could happen to him because Dutch authorities knew about it. Partly due to threats the media received, this interview was not broadcast until 2012. During so-called Dutch "police actions" of the late 1940's in the Dutch Indies, about 150,000 people were reputedly killed by combatants on both sides. On official assignment a few decades ago, Dutch historian Cees Fasseur investigated crimes committed by Dutch soldiers. In 2008 he admitted that this research was superficial. In 2000, Dutch TV journalists Alfred Edelstein and Karin Coevorden interviewed people in the village of Rawagede on the Indonesian island of Java. There, during the "police actions," innocent civilians had been executed by Dutch soldiers without trial. Rawagede's inhabitants were surprised by the journalists' visit to their village and told them that similar murders by the Dutch Indonesian army had occurred in a number of other villages in the area. In the Yugoslav wars in the 1990's a genocide took place in the town of Srebrenica. The Dutch United Nations soldiers there were told by their government to leave the town, without U.N. authorization. Thereafter, Bosnian Serbs murdered between 6,000-8,000 male Muslims from Srebrenica. A multi-year study by the Dutch Institute for War Documentation (NIOD) found that the Dutch government did not know about the risks to the civil population when they told their soldiers to flee. Shortly after the publication of that report, two ministers in that government Jan Pronk and Els Borst publicly stated that this major finding of the lengthy study was untrue and that the government had known about the risks. When I interviewed former Deputy Prime Minster Borst a number of years later, she confirmed this to me. All of that is history. 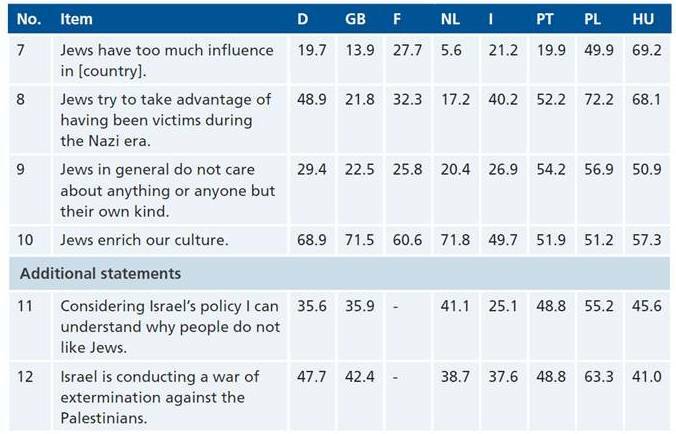 The question now is, how long will the Dutch media conceal the data from the Bielefeld University study on extreme anti-Israelism in the Netherlands from the Dutch people?